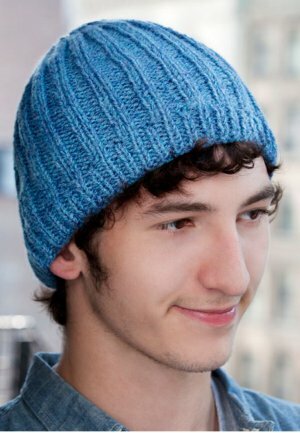 Men of all ages will like this Adam's Rib Cap from Red Heart Yarn. It's one size fits most, so there's no need to go around measuring everyone's head! This is a great beginner project for those who are new to knitting. GAUGES: 19 sts = 4”; 24 rows = 4” in rib, unstretched. 16 sts = 4”; 24 rows = 4” in rib, slightly stretched. CHECK YOUR GAUGE. Use any size needles to obtain the gauge. Special Abbreviation: ssk (slip, slip, knit) = slip next 2 sts knitwise, one at a time, to right needle, insert tip of left needle into these 2 sts from the front and knit together. Row 2: P1, * K1, P1; repeat from * across. Rows 3-8: Repeat Rows 1 and 2 three more times. Row 9: * K2, P2; repeat from * to last st; K1. Row 10: P1, * K2, P2; repeat from * across. Repeat Rows 9 and 10 until piece measures 6¾” from beginning, or desired length to crown, end wrong side row. Decrease Row 1: * K2, P2tog; repeat from * to last st; K1 – 73 sts. Row 2: P1, * K1, P2; repeat from * across. Row 3: * K2, P1; repeat from * to last st; K1. Decrease Row 7: * SSK, P1; repeat from * to last st; K1 – 49 sts. Row 8: P1, * K1, P1; repeat from * across. Row 9: K1, * P1, K1; repeat from * across. Decrease Row 11: * SSK; repeat from * to last st; K1 – 25 sts. Decrease Row 13: Repeat Row 11 – 13 sts. Decrease Row 15: Repeat Row 11 – 7 sts. Cut yarn leaving an 18” tail. Thread tail through remaining sts and pull tight to close top. Sew seam ½ stitch from edge on each side and weave in ends. I am new to I Pad use so haven't had a chance to do a craft, your service is excellent, thank you.